A frame press for gluing rectangular frames with three vertical clamps and a lateral clamp with two pistons. In the basic version the press is equipped with a common pressurising hand pump. The design of the vertical clamps enables them to mate closely thus permitting the clamping of very small frames. The vertical clamps can be fitted with locking pins and swivelling plates for clamping of bevelled frames and with counterweights for easier clamping. 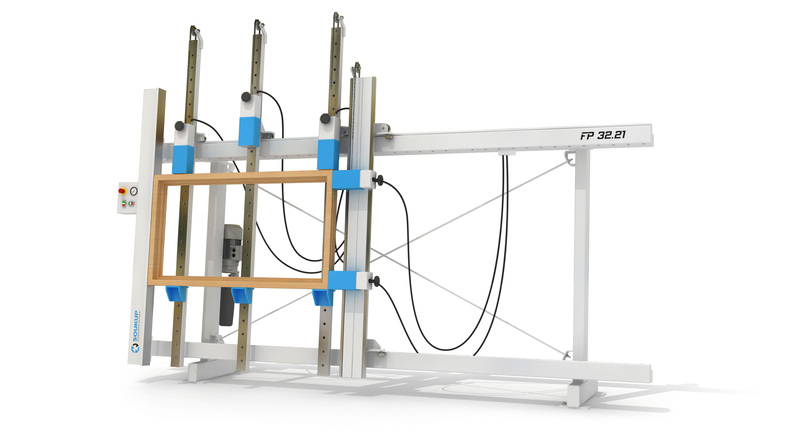 The FP-S series frame press is electrically operated and in the fully equipped version it offers clamping of straight or bevelled frames.